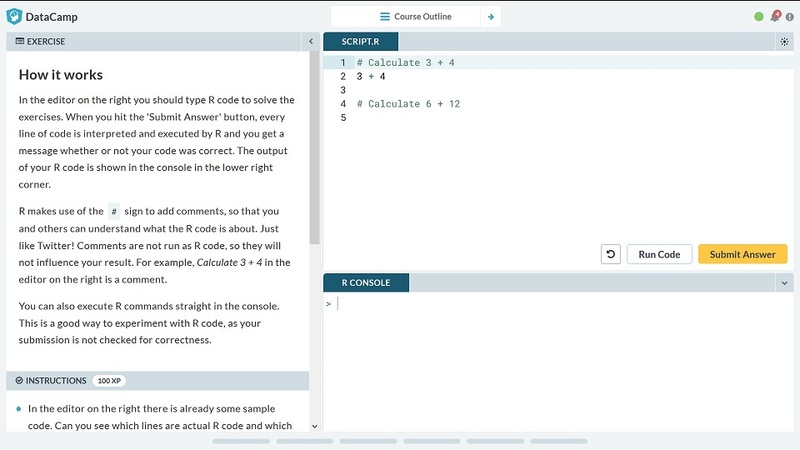 DataCamp’s Introduction to R* is an entry-level, course to get you started with R. The course gently guides you through the scary concept of coding and introduces you to the basic fundamentals of R. This course is certainly recommended to those who have little or no experience with working with R.
Intro to basics – Learn how to use the R console as a calculator and assign variables. Vectors – Create vectors, name them and select data within them. Matrices – Analyze matrices, name them and add more components to them. Factors – Learn about factors, their levels and ordering them. Data frames – Create your first data frame, select elements within them and sort them. Lists – Learn how to create a list and how to rename them. 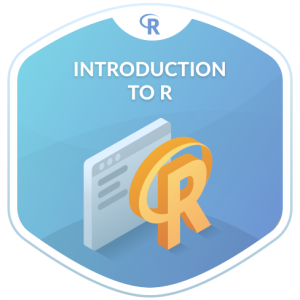 I enrolled in the Introduction to R course with minimal R experience to date. I have always wanted to learn how to use R, with the aim of using it as my platform of choice for statistical analyses. However, before I can even think about doing crazy statistical tests on my data, I needed to figure out how to use the software. This is when I decided to give the course a go. On the left of the window, you have your Exercise and Instructions which talks you through what you have to do. To the right, there is an online version of R. At the top is the R script where all of your code is entered. And beneath this is the R console, which returns your outputs. The first chapter utilises simple mathematical problems to demonstrate the potential for using R to solve simple problems. Further, you will then learn what a variable is and how to start manipulating them. 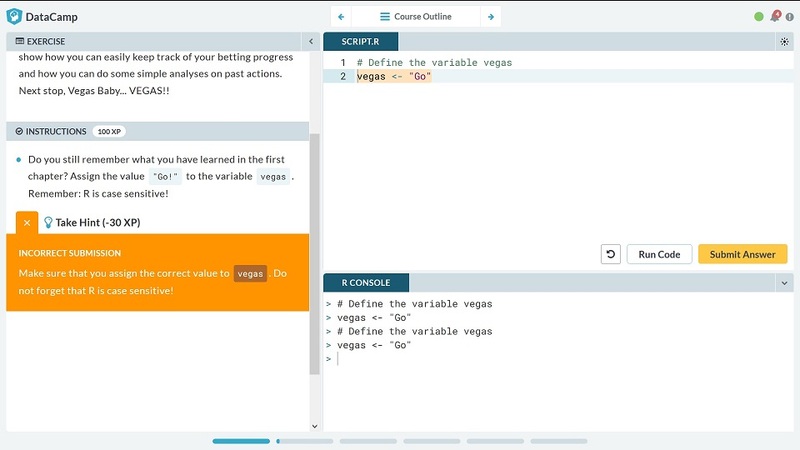 The DataCamp’s approach to using stories in their exercise provides a delightful setting to the task at hand. From here on I actually began to feel myself slowly picking up the concepts of R in no time and encouragingly I did it without the need of taking any hints! In the next chapter, I began creating vectors through the example of making it rich in Vegas! I wish! Funnily enough, it is here where I encountered a strict requirement in R. As asked, I entered the term “Go” into the R script, however, I missed off the exclamation mark which resulted in an error. This was my first experience with the instant feedback from the DataCamp window which swiftly prompted me to double check my code. Although it didn’t go into specific details of missing off an exclamation mark, it did reiterate that R is particularly sensitive. So if you do not follow the instructions precisely, you will be met with an error. Something you will come across frequently when starting out in coding! As I ploughed through the second chapter I started to become accustomed to thinking like a programmer. As the course said: ‘If you want to become a good statistician, you have to become lazy’. The exercises encouraged me to think about the easiest way I could solve the problem, albeit saving just a few seconds of typing, I soon realised the potential of this. Here you will learn shortcuts such as using the arguement SUM(), instead of manually adding vectors together using +. The third chapter in the course concerned the use of matrices. I started off by creating my own matrix. This was the same as the one in the example, so it would have been nice to have a different example to use instead. Once up and running with matrices, the series of examples were related to Star Wars box office numbers. It was actually interesting to me as a student and a Star Wars fan that the exercise included actual data on something I was intrigued about. This further reinforced my interest in learning. Despite this, I personally found learning about matrices a step-up from vectors. This is probably because matrices are two-dimensional, as opposed to a single dimension, thus it takes more time to ensure I am selecting the correct element. Past the halfway mark of the course, I started learning about factors. This was a lot more straightforward than matrices, probably because these are categorical variables which I prefer to deal with. It is at this point I realised that I have learnt a lot of commands during my short time on the course. Admittedly, I have a brain like a sieve so I found it hard to recall all the ones I had learnt. A downside to the platform is that there is nothing physically I can take away with me. Some may feel it better to make notes along the way. 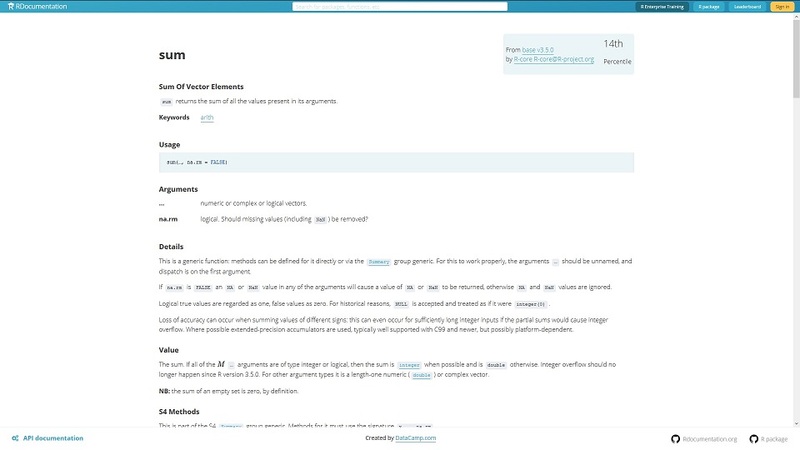 Alternatively, to my delight, I found out that DataCamp has created an RDocumentation site which contains all of the information for the R commands. This way, whenever I need to refresh on a command, I can find it on the RDocumentation site along with some examples. Now I reached the penultimate chapter: data frames. It is here that DataCamp started to introduce larger datasets in the form of the mtcars data. Like me, if you have worked with other statistical programs before such as SPSS, you will be more comfortable learning about data frames. Using the previous knowledge of creating vectors, you will start to piece these together to form data frames. There was one exercise where you are left to your own devices (Sorting). Here, the task is to ‘experiment with the order() function’ in the R console. I found myself just staring at the console while I struggled to figure out what to do. Even though you do not need to enter anything correctly here to move on to the next exercise, it would have been nice to be given a little direction for practise purposes. Finally, I came to an end of the Introduction to R course by learning about lists. I found the initial recap of what I had learnt so far useful. This makes you realise just how much the course had covered. Through creating my first list I didn’t quite understand their purpose. I knew it was to group data together, but why would you want to? Maybe my ignorance as a novice coder is coming through here. Overall, it took me approximately 2 and a half hours to complete the full course, which is way shorter than the time quoted on their website (4 hours). I was also given a certificate, or a Statement of Accomplishment, to show that I have completed the course successfully. This was a nice feature considering a lot of online courses and MOOCs require you to pay for the certificate as proof of completion. The exercises that incorporated a mini-story, particularly involving real-world data. There was nothing I could download from the exercises. Once the exercise was complete, everything I typed into the R scripts was reset. 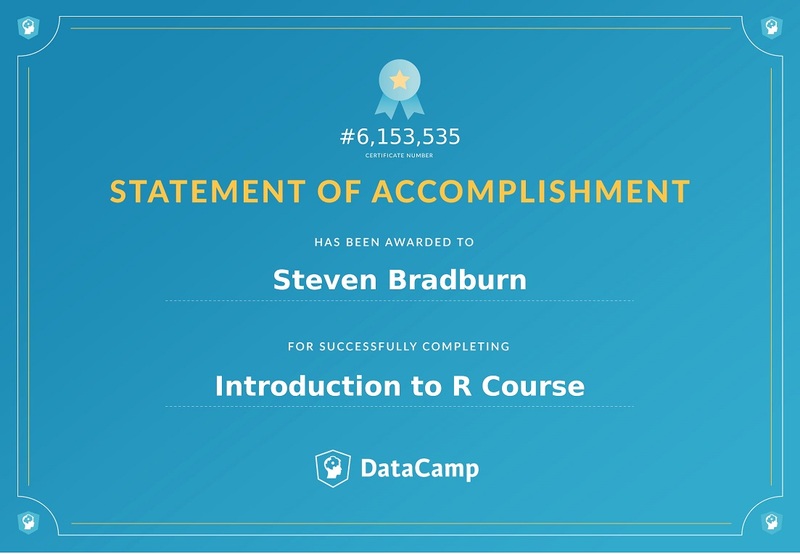 DataCamp's Introduction to R is a perfect course for those who have no or little experience with R. It is hard not to recommend a course which has a unique learning experience and is completely free!